Essence Magazine Loves "Love Songs, Ballads and Standards"
Essence Magazine has named Basin Street Records upcoming April 1st release by Irvin Mayfield and Ellis Marsalis "Love Songs, Ballads and Standards" as one of six upcoming CDs to look forward to this Spring! Come to New Orleans and see Irvin for yourself at the upcoming French Quarter Festival or at the New Orleans Jazz and Heritage Festival. This is the first of a string of new releases celebrating the rebuilding and the 10th anniversary of Basin Street Records. 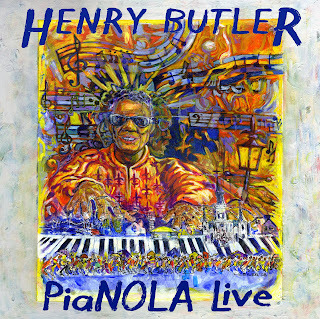 Jon Cleary in Florida, Henry Butler in Maryland. B.B.King. Don't miss Basin Street Records artists on the road this weekend. BB King or his club are involved in most of these gigs. Both Jon and Henry are performing at the New Orleans Jazz and Heritage Festival this year. Come visit New Orleans! I was just informed that Kermit Ruffins and the Rebirth Brass Band will perform "Drop Me Off in New Orleans" from Kermit Ruffins' Big Easy CD, and Troy "Trombone Shorty" Andrews will join the Rebirth Brass Band for a performance of "Do Whatcha Wanna" which Kermit co-wrote and has recorded with both Rebirth and on his own, The Barbecue Swingers Live, during the player introductions of the NBA All Star Game. Jon Cleary's tune, "When You Get Back", aired on tonight's episode of October Road. You can find this track on the Jon Cleary and the Absolute Monster Gentlemen CD on Basin Street Records. If you missed the episode you can watch it online HERE. The song can be heard in the background of a bar scene about 30 minutes into the show. 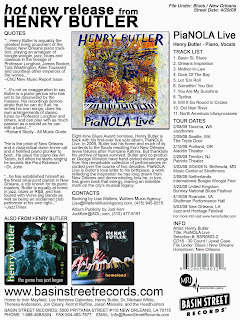 Basin Street Records is proud to announce the first live solo record by 8 time Blues Award Nominee Henry Butler, PiaNOLA Live. This CD will be released nationally on April 29th, 2008 and is the second release of 2008 scheduled by our rebuilt label. Click on the images for a larger, clearer view.